Today is the tenth anniversary of Pie and Coffee! Thanks to everyone who’s contributed, technically and creatively, to making this thing happen. I first got the itch to blog in 2003, when I was living at the Orange County Catholic Worker house, and the city decided to crackdown on their homeless shelter. It was a fascinating story, one that wasn’t being covered in the depth I thought it deserved. I finally started blogging here in 2005, when some of my friends had returned from a trip to Darfur and were inspired to commit civil disobedience in response to the violence there. Since then, a lot of people have posted things here. Some years it has been busy. In recent years, with the rise of Facebook as an outlet for casual online conversation, and with changes in my own life, it hasn’t been busy at all. This arc has been pretty typical of blogging. One of the nice things about a blog is that you can post things when the time is right, and ignore it when it’s not. One of the bad things is that as the months turn to years, and years to decades, it turns into a junk drawer. So we’ll be doing a once-a-decade cleaning of this junk drawer, looking back at the topics we’ve covered. We’ll revisit Darfur, reusable grocery bags, Worcester panhandling, climate change, Catholic Worker dramas, Guantanamo, podcasting, and more. How do our posts look in retrospect? What’s going on with those subjects today? I don’t know if this blog will be around in 10 years. But I’m really looking forward to year #11. 508 is a show about Worcester. This week, Mike and Brendan talk with Mauro DePasquale, Executive Director of WCCA TV13, Worcester’s cable access station (and the home of the 508 show). Mauro had just finished interviewing some guests for his own show, Soapbox, so we taped 508 on the Soapbox set. The best candidate roundup I’ve seen is Worcester Magazine’s. Here is a link to the 508 interviews of the City Council candidates. I haven’t seen signs for all of the candidates, so the “29” above is more aspirational than descriptive. April 15th started out full of hope. The weather was perfect as 27,000 men and women from 60 different nations lined up for the 117th Boston Marathon. I saw racers of every age, some in wheelchairs, some blind running with guides. There were even two dwarves. Thousands ran for special causes. The diversity and positive spirit was incredible. I ran well until 18 miles when my quads seized up. I slowed down and eventually walked a few stretches. After training all winter, I canâ€™t tell you how frustrating it was. To make matters worse, at the 22-mile mark, I was passed by a young man in a hamburger costume. I cried, â€œYouâ€™ve got to be kidding me!â€ But then, seeing the agony visible on my face, fans lining the course cheered like I was an elite runner. Children put out their hands for me to slap, and I felt the inherent goodness of the marathon. At 24.5 miles, my son Aiden, clad in his high school cross-country uniform, jumped the fence to help me finish. I was afraid Iâ€™d collapse, but Aiden kept me going. 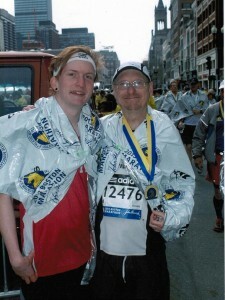 Once we turned from Hereford to Boylston Street and could see the finish, he encouraged me to find the strength to sprint. We crossed the line together and had just had our picture taken, when we heard an enormous explosion. We turned around and saw the second bomb go off. Our hearts sank. 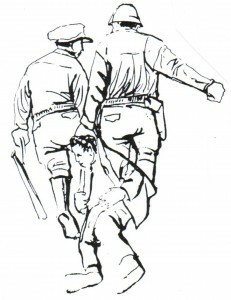 Why I am Hunger Striking at U.Va. Many of you may have heard that the 14 members of Living Wage Campaign at U.Va. have committed to a hunger strike on Saturday Feb. 18th.Â I am among the 14.Â Â Though I am no longer a student, I still feel very strongly about this cause and encourage you to get involved (see below).Â We are entering day 5 of the strike (see an update of the day 4 here).Â Â Moral is high, though we know that trying times are ahead.Â Â See some press coverage here and here or read an article about it here or here. The hunger strike decision did not come lightly nor easily.Â After years of engaging the administration in more conventional ways, including two meetings with the President herself, we became convinced that we needed different tactics.Â Read the our official announcement here.Â We are part of a 14-year long effort to secure justice for our community. We have the support of Charlottesville City Council, churches, and many other local community groups.Â Employees have also been voicing their support, though many are scared of retaliation.Â We’ve collected some anonymous testimonies from U.Va. employees, and a new one is posted everyday on our blog.Â Read one here. We are asking that this institution becomes one that prioritizes human needs.Â A “living wage” essentially is a wage that allows families to support themselves, based on the cost of living in an area.Â The fact of the matter is that hundreds if not thousands of U.Va. employees do not make enough money to live in Charlottesville.Â A recent survey showed that over 20% of Charlottesville families were below the poverty line.Â U.Va. is the largest employer in the City and has more than enough money to make a dent in local poverty levels.Â Employees are forced to work second or third jobs, go on government assistance, or make choices between healthcare and food.Â At a rally today, a local doctor who works mainly with low-income populations in town said that “many of the people he sees do not have health insurance, and many of these work for subcontractors at U.Va.”Â He supports us because he has seen the damage that below-living wages have caused.Â All of this while U.Va. employs most of the highest-paid Virginia State employees, with salaries reaching above $600,000/year. We are asking that the University pay at least $13.00/hr, including benefits, indexed to inflation (our full demands are online).Â Currently, U.Va. contracts labor services with private companies that can pay as little as $7.50/hr with no benefits.Â Direct U.Va. employees make more, about $10.65/hr with decent benefits, but that still puts them far beneath a living wage.Â If you want to learn more about what a living wage is, how it is calculated, etc. read our research document entitled “Keeping Our Promises.”Â It contains all the information that you need to know. We will soon be in the season of Lent, which as many of you know, is a season of fasting and penance.Â The connection between fasting and struggling for justice is as old as Christianity itself. St. Luke describes Jesus being â€œled by the Spirit into the wilderness, where for forty days he was tempted by the devil. He ate nothing during those days, and at the end of them he was hungryâ€ (Lk 4:1-2).Â Then, immediately after this trial in the desert, Jesus returns to Nazarath and describes His mission â€œto proclaim good news to the poor./He has sent me to proclaim freedom for the prisoners/and recovery of sight for the blind,/to set the oppressed free,/to proclaim the year of the Lordâ€™s favorâ€Â (Lk. 4:18-19).Â By quoting Isaiah and referencing the Jubilee as the manifesto of his earthly mission, Jesus unambiguously calls Christians to work for justice in the world. We pray that our own fast also awakens hearts to this call. I am inspired by Catholic Social Teaching, which clearly calls for a living wage and the prioritization of human needs in business. I draw upon the history of working for justice that is part and parcel with the Catholic faith. I draw courage from the writings of Dorothy Day and others. I draw strength knowing that you my friends and family are praying for me. I feel blessed to have this opportunity to apply the teachings of the Church and of Christ to my life. In the end, I decided to hunger strike because I believe that our institutions, especially ones of education, should be geared towards human needs and centered on the compassion of Christ. Jesus treated people’s needs as holy, and we should do the same. 1)Â The Campaign will be maintaining a public presence outdoors, near Brooks Hall and the Rotunda. Come anytime between 10 and 7 and join us holding signs, passing out flyers, or just to keep us company (it can get lonely out there! ).Â Check out the full schedule here. 3) Join the Living Wage mailing list for updates and action alerts. 5) Pray! Pray for the strikers, pray for a conversion of values among the administration, and pray for the hard-working families of Charlottesville. As day 5 of the strike ends, I am filled with hope and look forwards to seeing you tomorrow and any other day this week. Feel free to forward this to any of your friends or family. Wielding power is tricky. When famine struck Ireland in 1782-1783, the English government used its power to close the Irish ports to keep local food in Ireland, a policy which caused food prices to drop immediately. Merchants protested the port closures, but the government held firm. During the Great Famine of 1845-1852, however, the government did not act, the ports were left open, and huge quantities of food were exported from Ireland to England while the people of Ireland were dying of starvation. Not until almost a million died was any government relief organized, and it took the form of corn meal so coarse that it often killed the constitutionally-weakened Irish who ate it. The governmentâ€™s failure to save the impoverished Irish people is not surprising. Parliamentâ€™s primary constituency was the business class, which emerged from the famine wealthier in cash and property. On June 14, 1969, I won a prize for an essay called “What the Flag Means to Me.” Years in the Boy Scouts informed me of the symbolism in the American flag and taught me flag etiquette. I knew red stood for the blood of American patriots, white stood for the purity of American ideals, while blue stood for the glory of her achievements. I knew you should not fly the flag in the rain or at night, as well as how to fold it smartly into a triangle. I saluted it daily in school and believed that it must never touch the ground or be held in a parade at a lower level than another flag. I had seen enough movies to know that the Stars and Stripes coming over the horizon meant rescue from harm and the restoration of justice. I was proud to wear an American flag patch on the shoulder of my scout uniform. 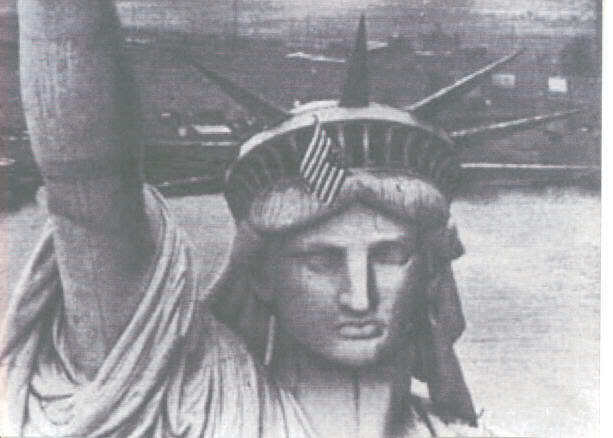 I was confused by newspaper images of Old Glory being flown upside down (a sign of distress) outside the crown of the Statue of Liberty by Vietnam Veterans Against the War. 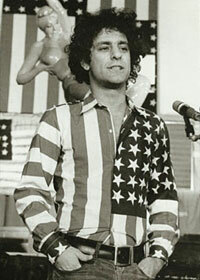 I was no fan of Abbie Hoffmanâ€™s American flag shirt or Peter Fondaâ€™s American flag helmet in Easy Rider. I saw these things as disrespectful. Pie and Coffee classic: The Real Saint Patrick, starring the Duffy Bros.
New essay on Pie and Coffee; somehow marked as published a week ago, rather than yesterday. Didn’t want you to miss it. Worcester, like many communities, is working hard to bring the Google Fiber for Communities pilot program to the city, so residents and businesses can get Internet access “more than 100 times faster than what most Americans have access to today.” Yochai Benkler, one of my intellectual heroes, headed a recent Berkman Center study of America’s screwed-up Internet market, and the mediocre Internet access we get as a result. If you’re wondering why cities are begging Google to bring them services that phone and cable companies won’t, this interview is a clear and detailed intro to the subject. In the South Seas there is a cargo cult of people. During the war they saw airplanes land with lots of good materials, and they want the same thing to happen now. So they’ve arranged to imitate things like runways, to put fires along the sides of the runways, to make a wooden hut for a man to sit in, with two wooden pieces on his head like headphones and bars of bamboo sticking out like antennas–he’s the controller–and they wait for the airplanes to land. They’re doing everything right. The form is perfect. It looks exactly the way it looked before. But it doesn’t work. No airplanes land. Activists can think this way, too. We’ve seen something work in the past, and so we try it again. Sometimes the underlying situation, power dynamics, and participants are very different, so the tactic or strategy doesn’t work. If we understand why it worked the first time, we can modify it to work in the present. But too often, if it doesn’t work, we just try it again with more passion. I mean, it worked for the Civil Rights struggle/labor movement/Gandhi/right here in this town in the 90s. Why wouldn’t it work for us today? The South Seas cargo cultists didn’t realize that the important thing about a radio was what was inside, not what was outside. We should step back more often to analyze what we’re doing, to create tactics and strategies that work like the effective ones of the past, rather than just looking like them. I’d bet we can avoid some of the worst of “cargo cult activism” by asking a few questions of the next thing we’re planning to try. Why do we think this will work? What’s a recent example of this working? How well do we understand that example? Did it work the last time our group tried it? If not, why not?